Bates junior Vantiel Elizabeth Duncan (Topsham, Maine) became a three-time All-American by finishing fifth in the women’s hammer throw at the NCAA Division III Outdoor Track and Field Championships last week at Marietta College. Duncan also came up just short of claiming a second All-America award in these championships on Saturday in the shot put, making the finals but finishing in ninth place with a top heave of 13.10 meters (42-11.75). Duncan was seeded 15th in the event going in. 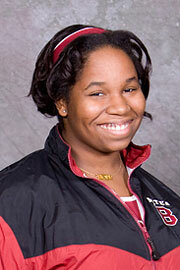 Duncan’s top hammer throw of 52.29 meters (171-6), qualified her for the nine-athlete final. It is her first outdoor All-America award, after twice achieving the feat at the NCAA Indoor Championships in the weight throw. Duncan and senior teammate Izzy Alexander (Harvard, Mass.) represented the Bates women’s team at the meet. Alexander placed sixth in the 400-meter hurdles to finish her career with five All-America honors, the second highest total in team history.